Now that it’s back-to-school time, it’s a great time to remember that of all the aids to literacy, reading out loud to children is one of the best. Even 15 minutes a day can increase vocabulary, interest, and understanding, not to mention the terrific feeling of bonding that it creates. It’s also great to remember that with reading aloud, the books don’t have to be at the child’s reading level at all. The difficult words create a wonderful time for parents to talk about words, ideas, and concepts. 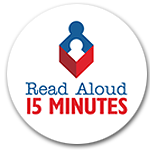 There’s a great website that encourages and explains the benefits of reading aloud, called ReadAloud.org. Let’s all do it!